South Carolina Department of Natural Resources biologists are looking for recreational and commercial crabbers to help them improve the design of a device that will help reduce bycatch while maintaining catch rates of large crabs. While large blue crabs are what most crabbers hope to see when they pull up their crab trap, other marine animals, known as bycatch, are also commonly caught. 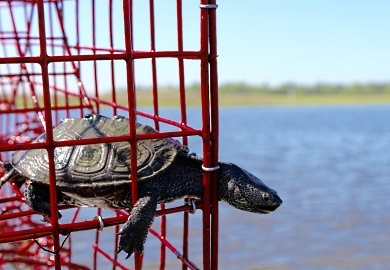 One bycatch species of particular concern is the diamondback terrapin, a marsh turtle that often enters crab traps, most often during spring, search of food but cannot survive long periods of time underwater. In recent decades, biologists and crabbers have developed bycatch reduction devices (BRDs) to reduce terrapin mortality in crab traps by preventing the turtles from entering. What they found was that the devices, which fit over each entrance hole on a trap, sometimes also prevented the largest and most desirable crabs from entering traps. This problem prompted S.C. Department of Natural Resources (DNR) biologists to explore new designs. After three years of development, the capture and measurement of nearly 4,000 blue crabs, and confirmation that blue crabs measuring seven inches point-to-point can enter traps outfitted with this BRD, DNR researchers are excited to release this BRD design to the public on a limited basis for further evaluation. Thanks to the purchase of 1,200 BRDs by the Charleston Office of the U.S. Fish and Wildlife Service, the devices will be publicly available for distribution and installation in recreational and commercial crab traps in exchange for input on BRD performance. DNR's goal is to test this BRD with 50 recreational crabbers and 10 commercial crabbers, beginning in fall 2016, in each of three regions: (a) Jasper, Colleton, and Beaufort counties; (b) Charleston County; and (c) Georgetown and Horry counties. Recreational crabbers will receive four BRDs to outfit one of their two licensed traps. Commercial crabbers will receive enough BRDs to outfit as many traps as they wish. BRDs will be installed by DNR researchers at a series of evening workshops beginning in late September, or can be self-installed after watching an online video. Study participants will be surveyed at a later date regarding their general impression of the BRD relative to crab capture and terrapin exclusion. If you are interested in participating in this study, please visit https://www.surveymonkey.com/r/CrabTrapExcluder to sign-up and indicate your availability to attend a BRD installation workshop near you. You may also sign up by calling (843) 953-9097. For more information about the development of this BRD design, please visit: http://www.dnr.sc.gov/wildlife/diamondbackterrapin/research/fisheries.html.